That’s right, I said it. I’m here in praise of Kardashian baby names. 2018 was a banner year for the reality show royals. Three sisters welcomed daughters, each with a surprising, didn’t-see-that-coming name: Stormi, Chicago, and True. (Well, maybe I had that last one on my radar.) Now Kim and husband Kanye West are expecting again in 2019. Plenty of the grandchildren’s names have proved influential, from Penelope to Dream. Every Instagram birth announcement brings with it waves of comment – often snarky, sometimes cruel – about the unusual names favored by the socialite siblings. But even if you’ve never seen a single episode of the hit E! series – heck, even if you’re not entirely certain who, exactly, the Kardashians are – there might be some lessons in their out-there approach to naming the next generation. The eldest Kardashian sister chose family-inspired middles for her first two children. Kourtney was the first to start a family in 2009. Son Mason Dash’s middle name comes straight from mom’s surname: KarDASHian. Before the baby, the sisters operated a boutique called Dash, so it wasn’t entirely novel. But it’s a good example of how to reinvent a family name. Daughter Penelope Scotland’s middle honors Kourtney’s Scottish heritage, but also her dad’s name: Scott Disick. When Kim and Kanye West welcomed their third daughter, they went with the wait-is-that-a-name Chicago for their second daughter. Chicago is dad’s hometown, a city he’s sung about countless times. He supports local organizations, too. There’s no question that Chicago’s name tells a story, and connects her to her family’s roots. 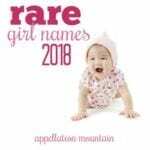 Looking for a choice with that kind of personal significance is always a good idea – even if the name is as classic as Anne or as popular as Ava. There are many good reasons to choose popular names. But if you’re set on finding a name your child won’t have to share, then it’s going to take some effort. Parents can turn themselves into pretzels avoiding anything in the Top 100 (or 500 or 1000) only to dismiss other names as too different. Sweet spot names are great, but picking a name that verges on the unique means that some people are going to dislike it – maybe a lot. 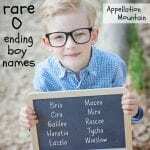 If you’re determined to find a truly different name for your child? Accept that you will have to use something completely and utterly unexpected. So often we settle on gorgeous names like Lucia and Beckett, only to feel disappointed when we meet another kid with the same name. Something tells me Kim and Kanye won’t have this problem. Even Kourtney, who had a knack for choosing Next Big Thing names for son Mason and daughter Penelope, went farther afield when naming her third child, son Reign. Figure out what unusual (or unique) means to you, and proceed accordingly. We name-watchers were convinced that we knew Kim and Kanye’s style: short noun names with big meanings. Predictions for their newest arrival’s name centered on picks like True and Key and Love and Lux. (That last one was my totally incorrect guess.) But Chicago is three syllables instead of one, nickname-rich (they’re calling her Chi, rhymes with shy, but I can think of a few more possibilities), and while there’s plenty of meaning, it’s not a virtue or a nature name. As parents, we often prioritize the pattern over the name itself. If sticking with self-imposed rules helps you find The Name? Great. But remember there’s much to be said for choosing the name you love, even when it doesn’t fit perfectly with your earlier choices. Here’s something frustrating, and all-too common, too: after lots of discussion, you announce that you’ll be naming your new daughter Everly. Your mother frowns and says maybe she’ll call her Evie instead, because Everly is just an awful name. Meanwhile, your sister is fuming that Everly has been her favorite name since she was thirteen, and how can you do this to her? Even when your sister, daughter, or friend has just chosen a name that makes your eyes pop out of your skull in astonishment, focus on the good. Your relationship and your shared love for the child matters a zillion times more than the fact that you’re appalled by the new baby’s given name. Do you have to go as far as Khloe and tweet heart eyes about the name? Nope. But there’s a brand new little human being here, and love and generosity should carry the day. Kardashian Baby Names: Role Models? While I’m not always comfortable with reality show oversharing, it strikes me that the family talks openly about compromising with their partners on naming, and often acknowledges that it can be tough to choose. Many of us can relate to those experiences. It’s easy to accuse the family of naming their children with publicity in mind, but I think their fearless approach to finding names works. 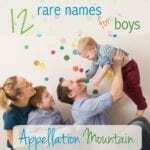 And even if you’re inclined to choose stand-out word names and the like for your children, there’s something to be gleaned from their choices. Because choosing a name you love, with personal meaning, that’s as unusual or as common as you want it to be? That’s a solid approach to naming your child. What do you think of the Kardashian baby names? Would you consider any of the names they’ve chosen for children of your own? Find even more baby naming lessons from the Kardashians here. Isn’t True’s name a family name too?